Getting gum disease is something far too many people take nonchalantly. Unfortunately, this causes them to go beyond the early stages quite often, making the damage add up and making treatment more difficult. 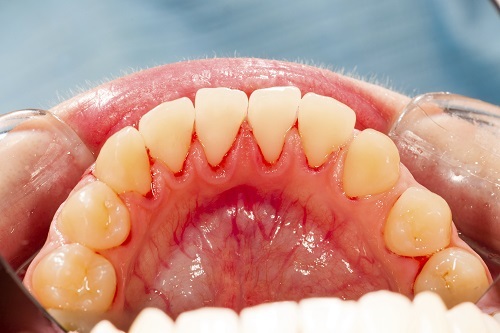 If you came in and saw us at the beginning of the symptoms, such as when you noticed that your gums first started to bleed, treating the problem would be a lot easier. Your bleeding gums are trying to tell you something. Don't ignore this symptom or put it off until later. Consider this. You go to wash your hands, when you suddenly look down and see that one of your palms is bleeding. Do you ignore it, rinse it off, and go about your day, or do you get it checked out by the doctor? Well, for many people with gum disease, they ignore this alarming symptom and go about their day. If you were to take all of the gum tissue in your mouth and put it into one spot, it would be nearly the same size as your palm. Going in and getting it checked at the first sign of a problem would give you the ability to heal yourself more quickly, effectively, and thoroughly. The bleeding is a symptom that should not be ignored. Your body is telling you that there is a problem in your gums, and it is only going to get worse. Brushing should not leave your sink pink. It should leave you feeling better when you are done, and keep your body healthy. If you notice bleeding when you brush, call us. We will get you in as soon as we can, and figure out the best treatment for your problem. Don't ignore what is going on, as it is only going to get worse.